A warm welcome to all our members and guests especially any new members for our last Club Night of 2018. Again, we had a good turnout for our last Hands-On night of 2018 with over thirty members and guests. 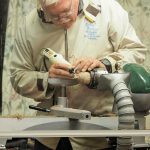 Thanks to John Liles, Chris Fisher, Stuart Lowe, Peter Hallam and Richard Holland for manning the lathes and providing the tuition. As this is our last meeting before our Christmas Dinner at ‘The Splash’ Little Cawthorpe on Tuesday 11th December make sure you have your tickets from John on the desk, excellent value at only £12.50. Don’t forget your entries for the Christmas Turning competition, which is judged on the night by our wives/partners. 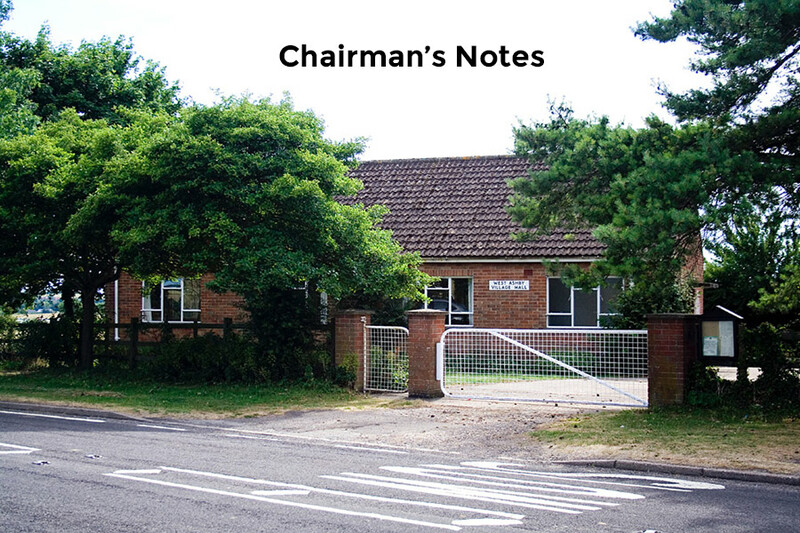 AGM – Several officers and committee members are stepping down at the AGM on 29th January. We will post a full list after our committee meeting on December 5th. Nominations for any of the posts must be sent to the Secretary 14 days prior to the AGM and must have prior consent of the nominees. Please support the AGM as it is your club and you should be involved with all major decisions. Prizes for our Grand Draw are slowly coming in, but we still need more – can you help? You could approach local companies to ask if they would sponsor a prize. Tickets for the Grand Draw are now available in books of 5 – if each member could take a few books to sell to friends or relations it would be a great boost to sales. When you next visit the shop why not purchase that extra roll of sandpaper or an item from our finishing range. We could then make up a box of items as a prize. Please continue to bring your unwanted items such as clothes, books, bric-a-brac and any unwanted Christmas presents to our collection point in the club shop. 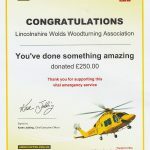 We have just raised another £250 for the Lincs & Notts Air Ambulance. Thanks for your support. See details on the website. Don’t forget to visit our shop as we have a full range of finishing products and many other interesting items – all at bargain prices. By the time you read this we should have the special glue for joining the components of the hanging bauble which Emma used in her demonstration. All our demonstrations are recorded and DVD’s produced (with permission of the demonstrators). We have a collection of over 100 DVD’s available for you to purchase or hire; see Jay for further information. Our Christmas Dinner at the Splash, Little Cawthorpe 11th December. Our next ‘Hands On Night’ 8th January 2019. Our Demonstrator for tonight 27th November is Robin Barlow. I hope to see you all then, but in case you don’t make the meeting I wish you all a Happy Christmas and a Prosperous New Year.